Is three some kind of magical number? Sapphire Technology has demonstrated 3D gaming running on three screens using a single graphic card from the company and the ATI Eyefinity multi-monitor functionality. With 3D already beginning to make a big impact in gaming, graphics card specialists Sapphire is keen to display the latest in PC gaming technology. 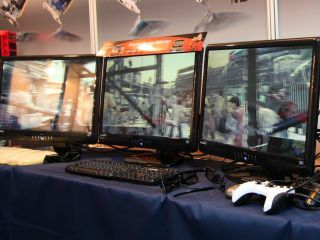 The three Zalman Trimon 3D monitors were powered by a Sapphire card with Eyefinity technology. The 3D support was added by running an additional 3D driver from iZ3D, with games like Tom Clancy's Hawx2, Left4Dead2, BattleForge and Dirt2 all shown off. "This technology demonstrates that games and applications can be displayed in 3D on multiple screens, and run smoothly, without the need for multiple graphics cards or expensive shutter glasses," said Bill Donnelly, Global PR Director for Sapphire. "This approach uses low cost glasses, and can be run on any system with an ATI-based Sapphire graphics card that has ATI Eyefinity support." Of course, three 3D monitors, the glasses and the graphics card may make your wallet a little less three dimensional, but we'd certainly like to give the technology a try.